It’s very easy to get sidetracked in my line of work. I know I’m supposed to be focusing on stuff for children but I get distracted by things such as ballet style slippers that are like eiderdowns for your feet. I need some of those… terrific! They also come in kid’s sizes. According to the hype, Blu Moose are a ‘cult slipper brand’ and I can understand why. 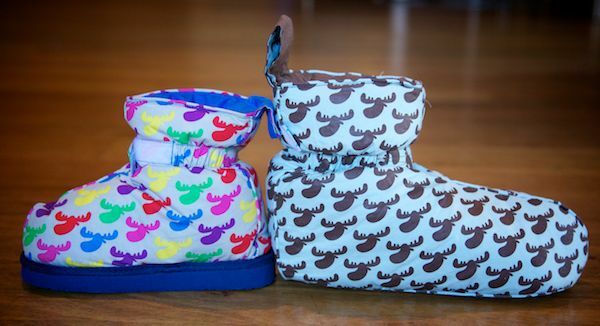 Blu Moose slippers are made of feather and down – could there be anything toastier for little feet?! Created by Melburnian Natasha Wells, the slippers were inspired by Swedish dun sockar (doona socks). There are lots of designs to choose from but I think the ‘Mixed Sweets’ pattern, channelling the neon brights of the eighties, is the way to go. Choose between a lightweight sole (so that you don’t have to take them off in bed) or a hard EVA sole (suitable for wearing outside), the slippers are also machine washable. I’m wondering if I can get away with wearing a pair of Mixed Sweets to school drop-off in the same way that celebs are seen out-and-about in their Uggs? Slippers and boots are available directly from Blu Moose. Children’s boots are $24.95 and women’s and men’s boots are $49.95. Ballet ‘slippers’ for mums are $29.95.